Please note: This recipe takes approximately 3 hours to cook (but it’s totally worth it). Heat 1 tablespoon of oil in a large heavy-based, ovenproof casserole dish over medium-high heat. Cook beef for 3 to 4 minutes each side or until browned. Remove and transfer to a plate. Heat remaining oil in casserole dish. Add onion. Cook, stirring for about 5 minutes until softened. Add garlic, ginger, star anise, cinnamon and orange rind. Stir and cook for around 1 minute until ingredients are fragrant. Add wine or vinegar. Simmer, for another 2 minutes or until reduced slightly. Add Worcestershire sauce, soy sauce, orange juice and beef stock. Cover and bring to the boil. Return beef to dish. Season with cracked black pepper. 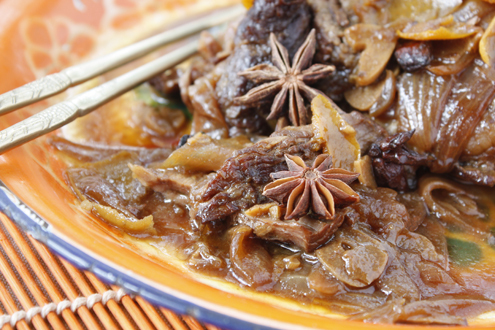 Turn heat down to low and simmer covered, for 3 hours at least, until beef is tender. During this time, turn the beef over occasionally or spoon the juices over it to baste and keep it moist. You’ll know it’s done perfectly when the meat flakes off with a fork. You can always leave it to sit with the heat off and the lid on for another 15 minutes. Variations: Use bok choy/ pak choy or Asian greens in place of beans and some boiled or steamed baby potatoes instead of rice. Made this today in the crockpot. Made the “juice” minus the onions on the stove. Then placed the onions, roast (as is), potatoes, and juice in the crockpot. Turned out great 3 1/2 hrs later. My one hour was great! Even with a skinny cow ice cream bar for dessert!